Many of the most popular runs in the Southeast US either don't have online gauges (Big Creek, Big Laurel Creek, Doe Gorge, North Fork of the French Broad, West Prong of the Little Pigeon, Wilson Creek, etc. 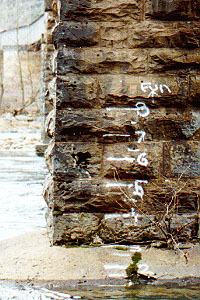 ), or have online gauges located well downstream of the reaches of most interest to paddlers (Nolichucky Gorge, Little River, etc.). Other runs have optimally located online gauges, but the gauges are so new we don't know what they are telling us (Cheoah, Cullasaja, Daddy's Creek, etc.). Good online flow gauging information would make it easier for paddlers to find rivers and creeks to run, and would spread use across a wider number of rivers and creeks, reducing the pressure on the most popular runs. Create a series of virtual gauges, based on rainfall and flow levels in related watersheds. The starting point for these virtual gauges will be the rules of thumb paddlers have developed over the years, but they will be refined through systematic data collection and statistical analysis (linear regression). 1. Every time you run (or drive past!) a river or creek in the Southeast US, record the visual gauge level, time, date, and your impression of the level: too low, low, moderate, high, too high. Be as exacting as you can (time to the minute if possible, etc.). When you get home e-mail this information to me: Gauge Report. Note #1: the statistical techniques I'll be using have the best chance to do their job for us the more data we have, including data on levels that are too high or too low to run. Send me all your data, including data from the days you got skunked!!! Note #2: I am looking for data on every river and creek in the US, including those that have well-known gauges in optimal locations and those not included on the Asheville Area Boating Beta Page. I'll use the impressions of the levels (too low, low, moderate, high, too high) to refine the descriptions of the runs on my page; and over time I expect to add additional runs to my page. So . . . send me your observations every time you run (or drive past!) a river or creek in the Southeast US! 2. If you keep a river log and have past data on levels and times, contact me. I'll be able to use past data IF you kept accurate level and time records, if I can obtain archived rainfall and flow information, and if riverbed changes haven't rendered the data obsolete. 3. For every useable observation (a level, a time, a date, and your impression of the level) I'll hold a raffle ticket in your name. If you record this information twice (before your run and after), you'll receive two tickets, etc. Every time I receive 100 usable observations, I'll randomly select a raffle ticket, award a prize, and the process will start over again. The prizes I have been able to solicit to date include rescue knives, throw ropes, dry bags and $50 gift certificates. In other words, they are worth your time! 4. I will use the data you collect to create statistical flow models for rivers and creeks without their own online gauges. These models will predict flow levels based on rainfall and flows in related watersheds. If a river or creek has an online gauge but no information on how to interpret the levels, I'll use your observations to correlate flows with paddling levels. There are a number of ways you can help The River Gauges Project: as a data contributor, as a financial donor, and as a prize donor. All contributors will receive public recognition (unless they chose to remain anonymous), and in some cases, more. Contact The River Gauges Project (email link) to donate or for additional information. 1. Data contributor Contributes data and receives raffle tickets as described above. Name listed on Contributor Page. If contributes 30 useable observations (a level, a time, a date, and your impression of the level) or more, receives a copy of The Paddler's GIS Disk™ (described below). 2. Individual donor Donates money to support this web site and project. If donates $10 or more in a calendar year, name listed on Contributor Page. If donates $30 or more in a calendar year, receives a copy of The Paddler's GIS Disk™ (described below). 3. Business donor (cash) Donates money to support this web site and project. If donates $30 or more in a calendar year, name listed on Contributor Page. If donates $100 or more in a calendar year, receives right to place logo linked to donor's web page on Contributor Page. 4. Business donor (gift certificates) Donates money to support this web site and project. If donates one $50 gift certificate or more in a calendar year, name listed on Contributor Page. If donates three $50 gift certificates or more in a calendar year, receives right to place logo linked to donor's web page on Contributor Page. Use of the gift certificates is at the discretion of the The Asheville Area Boating Beta Page / River Gauges Project, but ordinarily will be distributed as prizes in the data collection raffle. 5. Business donor (merchandise) Donates merchandise to support this web site and project. If donates $90 in merchandise or more in a calendar year (retail value), name listed on Contributor Page. If donates $300 in merchandise or more in a calendar year (retail value), receives right to place logo linked to donor's web page on Contributor Page. Use of the donated merchandise is at the discretion of the The Asheville Area Boating Beta Page / River Gauges Project, but ordinarily will be distributed as prizes in the data collection raffle. A Geographic Information System is a mapping software that allows users to combine layers of information about places. The Paddler's GIS Disk is a CD-ROM containing two GIS data viewers, a data viewer utility, and a set of GIS layers of special interest to paddlers. With a viewer and a set of layers you can create maps of the rivers of any region in the US, add the USGS stream gauges to the map, add the USFS and NPS lands, add the roads and highways, etc. The data viewers and viewer utility included on The Paddler’s GIS Disk are provided under license from Environmental Systems Research Institute, Inc. (ESRI). To obtain a copy of The Paddler's GIS Disk contribute either $30 or 30 useable observations (a level, a time, a date, and your impression of the level; I'll keep track of the number of observations you have sent me over the months or years) to The River Gauges Project (email link). Copyright © 2000-2003 [Chris Bell, Asheville, NC].